On Saturday night at 8:30, all around the world people will be celebrating Earth Hour by turning off their lights for one hour. It is a movement for change, a call to environmental responsibility. Last year more than 5,200 cities and towns in 135 countries worldwide switched off their lights for Earth Hour, including our little home. This year, we'll be participating again. But instead of sitting at home in the dark, we will be outside with friends, enjoying the evening and the beauty of our natural surroundings. And for you, dear readers, I have a small gift. 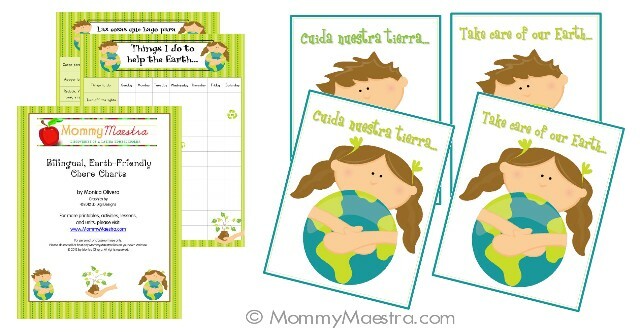 A set of bilingual Earth-friendly chore charts and note cards. May you enjoy them and remember the blessing we have in our planet. You can download both of these for free from my online shop. If you download the files, I simply ask that you please leave some feedback on my store. Thank you! Love this! We already got started on our love our mother earth projects can't wait to share! Pinning this printable!